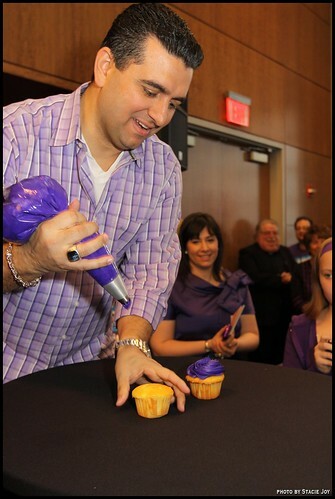 Giveaway: Tickets to see Cake Boss Buddy Valastro in Staten Island! Nothing I like better than giving away stuff to cupcakers on Cupcakes Take the Cake. Isn't it fun to win something? Better when it's two tickets to see Buddy Valastro, the Cake Boss himself! Due to the last-minute nature of this event (it's this Wednesday, November 2, 2011) and the fact that's in Staten Island, NY, please only respond if you know that you can attend. St. George Theatre - Staten Island - Wednesday, November 2nd at 7:30 pm. In this live interactive event, the baker and star of TLC's “Cake Boss” will share the stories behind his hit TV series and his Italian family, answer audience questions, and give a live demonstration of the techniques that have made him one of the most successful and renowned cake artists in the nation. Buddy will even invite audience members to join the fun on stage. Only respond to this giveaway if you know that you are free and able to attend the event. Leave us a note in the comment section, below, with an email address contact, and we will contact the winner on (Halloween!!) Monday, October 31, 2011 at 5 pm ET. Good luck folks, and CTTC will see you there! Buddy making cupcakes (they were delicious). 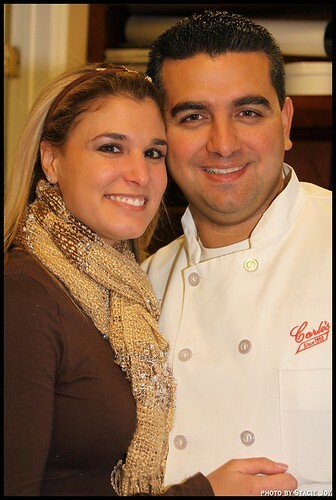 The Cake Boss and the real boss (his wife!). Huge fan ,,when do they announce the winners!.. Angie F -- can you please send us your email address at cupcakestakethecake@gmail.com? Thanks!